Medical waste management is becoming a high-priority environmental concern in developing countries in Asia. The United States-Asia Environmental Partnership (US-AEP), a public-private initiative implemented by the U.S. Agency for International Development (USAID), has played an important role in promoting the establishment of medical waste management practices over the past seven years. Through its integrated approach to activities in this sector, US-AEP has successfully assisted developing countries in Asia to advance awareness of medical waste issues and gain access to technology solutions for effective medical waste management. According to the World Health Organization, the waste produced by health care facilities carries a higher potential for infection and injury than any other kind of waste.1 Medical waste can consist of infectious, radioactive and toxic substances, as well as unsafe materials from hospitals, laboratories and clinics. It includes sharps, blood products, tissues, body parts, pharmaceuticals, cytotoxins and heavy metals, in addition to general paper, food and plastics. The negative health and environmental impacts of medical waste may include the transmission of disease by viruses and microorganisms, as well as contamination of underground water tables by untreated medical waste in landfills. Developing countries in Asia contain some of the most densely-populated, polluted cities in the world, yet many countries in this region do not have comprehensive systems for dealing with medical waste. Some of the most prevalent problems regarding medical waste in Asia are separation of infectious waste from general waste; reuse of disposable syringes and other untreated equipment; lack of awareness and training for healthcare professionals; and inadequate storage facilities, transportation and disposal equipment. Competing with all of the other environmental problems faced by developing countries, medical waste is often overlooked or simply viewed as a solid waste issue. However, sound medical waste management is key to protecting public health in Asia and requires dedicated planning, training and tracking throughout the medical waste collection, storage, treatment and disposal process. US-AEP recognized the need for assistance in the development of medical waste management regulations, services and practices in developing countries in Asia as early as 1995. Since then, US-AEP has been building capacity in these areas by contributing to the development of new regulations for medical waste treatment and disposal, and promoting the transfer of appropriate expertise and technology to public and private decision-makers. In creating US-AEP, the White House recognized Asia's growing commitment to sustainable development and America's increasing eagerness to share its experience, technology and management practices. With the participation of a wide range of partners and a variety of programmatic tools, such as exchanges and trade leads, US- AEP has become a flexible, responsive vehicle for delivering timely answers to all kinds of environmental questions. US-AEP has offices in six developing countries in Asia (India, Indonesia, Philippines, Thailand, Sri Lanka and Vietnam), as well as a presence in many other Asian countries. Through the technical representatives who head these offices, US-AEP implements activities that further a comprehensive approach to medical waste management, via knowledge transfer and technology transfer. Effective medical waste management programs are multisectoral and require cooperation between all levels of implementation, from national and local governments to hospital staff and private businesses. US-AEP began its involvement in medical waste management by prompting awareness of the issue in Asia. Since 1995, US-AEP has managed 18 exchanges between hospital administrators and technical staff, government officials, academics and businesspeople in the medical waste field in the United States and Asia. These professional exchanges provided the participants with opportunities to confer with government and industry authorities, observe and evaluate facilities and technologies first-hand for their suitability and meet face-to-face with potential partners. US-AEP embodies a model of cooperative development, one that encourages U.S.-Asian partnerships with governments and industries as well as private organizations. US-AEP/Mumbai has been driving the development of medical waste legislation in India over the past several years through its membership on a national panel working to address improper handing and treatment of medical waste in India. In 1998, the US-AEP/Mumbai Technical Representative proposed a five-step strategy (waste minimization, segregation at the source, disinfection, treatment and disposal) and recommended modes of treatment in the final legislation, which was accepted by the Ministry of Environment and Forests and the Central Pollution Control Board. Demand for medical waste equipment is rising in developing countries throughout Asia. For example, it is estimated that the 1998 medical waste legislation in India will result in collective spending of $2 billion over the next decade by 11,000 Indian hospitals and 27,000 nursing homes.4 Similarly, in Taiwan, where 42 tons of infectious medical waste is generated per day, the market for alternative non-incinerator treatment technologies is opening.5 The government of Ho Chi Minh City, Vietnam, has identified medical waste management to be a main focus of its current five-year plan, implemented by the Department of Health.6 In Metro Manila, approximately 20 tons of medical waste is collected every day.7 These facts illustrate the need for effective medical waste management in Asian developing countries and indicate the market demand that exists for treatment and disposal technologies. The technology transfer component of US-AEP's medical waste capacity building strategy involves helping Asian developing countries access appropriate technologies to treat their medical waste. By sponsoring Asian delegations at trade shows and disseminating procurement opportunities to a database of environmental companies in the form of trade leads, US-AEP helps Asian companies and municipalities to learn about new and existing medical waste treatment technologies. Requirements for the treatment of medical waste vary throughout Asia. For example, in the Philippines, incineration of medical wastes has been banned, while in India incineration remains an acceptable form of medical waste treatment. The following cases demonstrate how US-AEP has assisted Asian organizations in obtaining the necessary technologies to meet and exceed their government's standards. US-AEP facilitated the procurement of three pilot autoclaves by the West Bengal government in Calcutta two years ago. When the Mark-Costello Co. responded to the US-AEP trade lead with an offer, it resulted in a $127,000 sale for the U.S. firm. The purchase of these autoclaves has allowed the West Bengal medical community to eliminate a weekly release of over two tons of untreated biomedical waste into the area's unsecured landfills. Not only does the treatment of this medical waste reduce the practice of salvaging and reselling waste items back into the market, it also reduces human health risks by preventing the contamination of underground and surface water bodies from landfill leachates. In the Philippines, the transfer of autoclaves as alternative non-incineration medical waste treatment technology assisted St. Luke's Medical Center in its efforts to comply with stringent new regulations banning incineration. The passage of the 1999 Clean Air Act of the Philippines led many Philippino hospitals to seek new technologies to treat medical waste. The US-AEP Manila office, in conjunction with the Environmental Technology Network for Asia (ETNA) program, submitted a trade lead, which resulted in Collosians Environmental Services Inc. becoming the executive distributor of Bondtech autoclaves in the Philippines. This partnership culminated in a project to assist St. Luke's Medical Center with the disposal of their hospital waste. In order to comply with the Clean Air Act, St. Luke's Medical Center purchased an autoclave waste disposal system worth $279,750 from Bondtech in October 2000. In addition to promoting environmental development abroad, US-AEP's programs have supported the U.S. environmental organizations and companies interested in expanding into Asia. The growing significance of medical waste management in the developing countries in Asia reflects an emerging area of business opportunities for U.S. firms. By facilitating long-term relationships, such as joint ventures and agent-distributorship agreements between United States and Asian industries, and providing business opportunity notices and counseling services to U.S. organizations, US-AEP helps interested U.S. entities gain access to Asia. 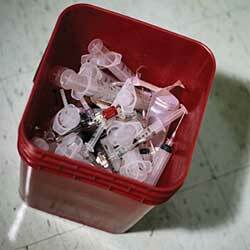 Medical waste poses a significant environmental health problem if not managed in a comprehensive way. Asian decision-makers from various countries now recognize that medical waste issues present a major concern and are interested in learning about best practices from throughout the world, especially from the United States. Attention to medical waste issues in Asia has increased over time, leading to new regulations and a demand for suitable treatment technologies. US-AEP has identified and addressed this demand by espousing an integrated approach to medical waste management, which has transcended the transfer of treatment equipment to include information-sharing and policy development. By providing guidance on environmental governance, as well as meeting the need for the technical equipment and services, US-AEP has encouraged Asian developing countries to adopt a new attitude towards medical waste. US-AEP's medical waste management activities illustrate the success of the "partnership" aspect of the US-AEP program in this sector. US-AEP capacity building activities have provided a strong beginning for U.S.-Asian cooperation on medical waste management, but for both parties, these efforts represent an ongoing process, and there is still a long way to go. 1Salkin, Ira and Kennedy, M.E. (Ed). Review of Health Impacts from Microbiological Hazards in Health-Care Wastes (Draft). World Health Organization, 2001. 2Institute for International Education (IIE). Activity #763. October 1999. 3CSG/US-AEP State Environmental Initiative Quarterly Report #30. Council of State Governments (CSG), March 2002. 4Parasnis, Suneel. Biomedical Waste Management Cable. U.S. & Foreign Commercial Service and U.S. Department of State. August 1998. 5Robb, Corrie and Lewis, Mark. Industry Sector Analysis: Medical Waste Treatment. U.S. & Foreign Commercial Service and U.S. Department of State, October 2001. 6Tran thi Chau and Hoang thi Ngoc Ngan. Ho Chi Minh City Environmental Strategy. Department of Science, Technology, and the Environment (DOSTE)/ Ho Chi Minh City, 2001. 7Madrazo, Alma Bella and Barrios, Angelica Andrea. Industry Sector Analysis: Medical Waste Handling, Treatment, and Disposal Equipment. U.S. & Foreign Commercial Service and U.S. Department of State, June 2001. 8Pike, Julie, Heidema, Sarah, and Morris, Amanda. The US-AEP/NASDA Overseas Program Fund Successes & Analysis. National Association of State Development Agencies (NASDA), February 2002. This article originally appeared in the October 2002 issue of Environmental Protection, Vol. 13, No. 9, p. 26.